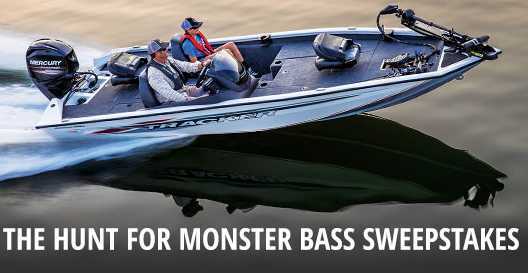 Enter into the Bass Pro Shops Hunt For Monster Bass Sweepstakes right now for your chance to win a Pro Team 175 TXW Tournament Edition boat with Mercury 60 ELPT and custom trailer. How To Enter: Go to this link:www.basspro.com/monsterbass or www.cabelas.com/monsterbass during the sweepstakes period and follow the online instructions to register by entering all information requested on the registration form and once you filled out the entry form now click on the submit button to complete the registration form. Prize: There will be one grand prize winner in this Sweepstakes, Who could receive a Pro Team 175 TXW Tournament Edition boat with Mercury 60 ELPT and custom trailer. Total ARV of grand prize is:$19,395.!! When To Enter: This sweepstakes entry begins at 12:00 am Central Time (“CT”) on 3/10/19, and all entries must be received by 11:59 pm CT on 6/30/19. Who’s Sponsor: The Sponsor of this Sweepstakes is Bass Pro Outdoor World, L.L.C., 2500 E. Kearney, Springfield, MO 65898.